There are so many amazing nursery design ideas nowadays. Just plug “nursery” into Pinterest and you will find many drool-worthy rooms. But are all these rooms designed with sleep in mind? Movies tend to show the last step for setting up the perfect nursery is assembling the crib. The dad is usually fumbling around trying to figure out why there are three extra bolts. In reality, most of us have that bed ready to go way before due time. We dream of creating a cozy place for our new little one. But here’s the kicker, often these designer rooms have forgotten the main purpose – sleep! When walking through the baby store, it’s hard to resist the adorable mobiles, the fluffy teddy bears and all the other extras that are lining the shelves. In actuality, all you need to pick up is a quality crib mattress, a few sleep sacks and blackout curtains. So, if you are designing your nursery or your baby isn’t falling asleep in your beautifully crafted room, here is my advice – make the room dark, cool, comfortable and boring. Good use of blackout drapes. Cribs should have just the mattress and a crib sheet, no extras. Invest in blackout curtains or blinds. 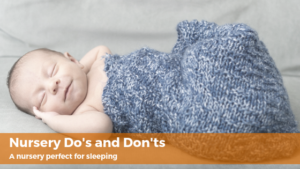 To establish consistency, every effort should be made to have your baby nap and sleep in their own crib. The blackout curtains will help your baby go down with a lot less fuss as no outside light is coming into the room during the day. Cool as in temperature. Studies show that babies sleep best in a room that’s kept between 65 and 70 degrees. This may seem cold, but you can always use a warm sleep sack or onesie. If you live in a hot climate, you may want to invest in a fan and lightweight sheets and sleepwear in order to keep the room feeling cool. Also, those blackout curtains that you have invested in will help limit heat transfer. Pretty in Pink. A nice simple design. Reminder: always take the pillows out before putting your baby to sleep. Babies sleep a lot, nearly half the day! Do your research to find a quality mattress. There are a lot of options: organic, innerspring, foam, memory foam, or a dual sided mattress. Consider cost, comfort, and durability, as your baby will use it for up to three years. Don’t forget to throw some comfortable crib sheet into your shopping cart. You do not need to buy crib bumpers. In fact, we strongly urge against them as they pose a suffocation risk. Bumpers were originally made to prevent an infant’s head from being stuck in the slats, but cribs are now manufactured so that the slats are too close for this to happen. If you still want something to protect your little one’s head from bumping the side, there is a product called wonder bumpers that are like pool noodles that wrap around the slats. 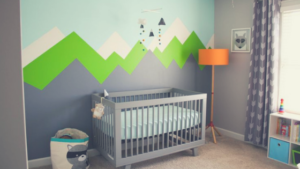 This is a very cute nursery, but it is best to avoid bright contrasting colors. This is probably the hardest tip on the list to follow. Music, fun murals, or swirling colors are not as calming as we think. For the same reasons that you should turn off your screens at least an hour before bed, it’s stimulating rather than calming. As for color on the walls, it will depend on your taste, but avoid intense colors like bright green. Also avoid contrasting patterns, because once babies are able to see color, contrast is very stimulating. You really only need a crib and fully stocked change table in the nursery. I know… Boring. A pretty and unstimulating nursery if the pillows and mobile are removed. Your nursery can become a busy place. It’s your baby’s dressing room, bathroom, and sometimes the dining room if you breastfeed in a rocking chair. However, the main focus of your design should be sleep. Create a little sanctuary for your baby’s sleep. Make it a quiet and relaxing place. You will appreciate how the unstimulating environment results in less fuss during nap and bedtime. If you have any questions about your baby’s sleep needs or how to develop effective sleep routines, we would love to connect with you.